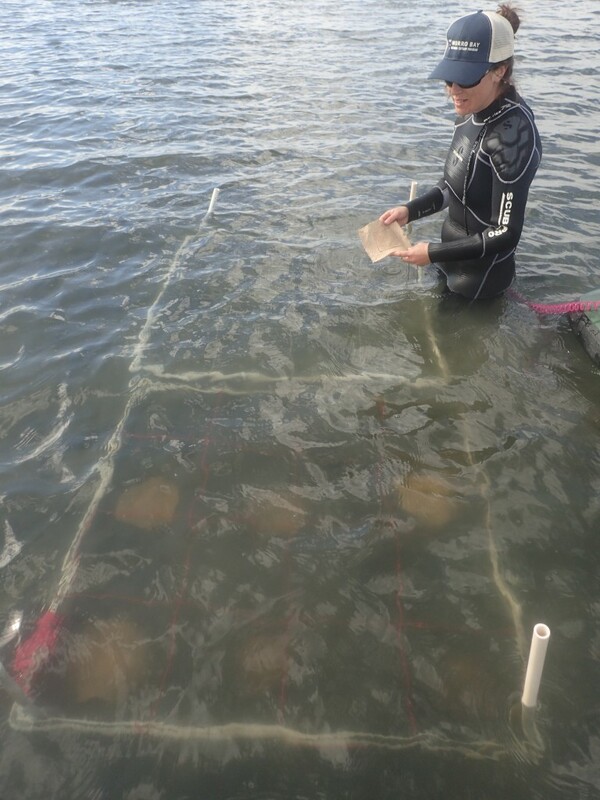 Protecting and restoring the bay and estuary takes a lot of boots on the ground…as well as the occasional wet suit. See what our volunteers and field staff have been working on during the past month. 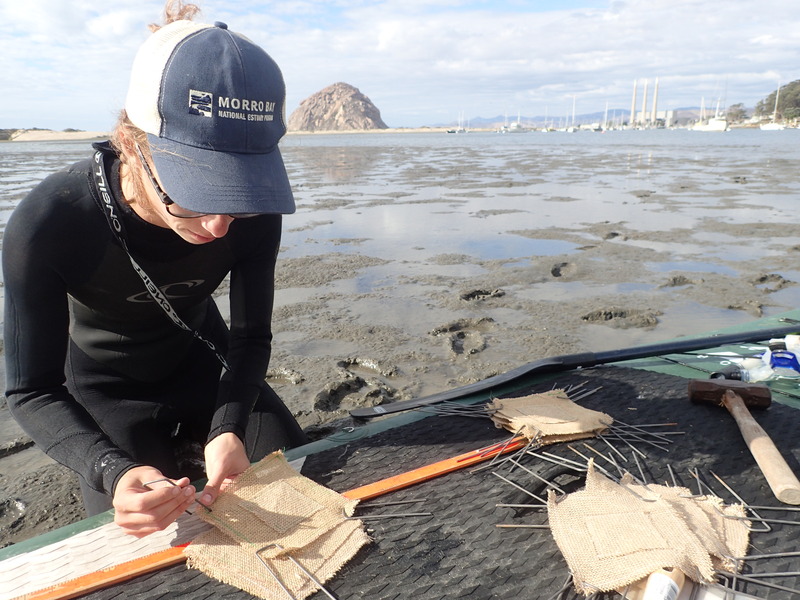 The highlight of fieldwork in October was collecting our final blades of flowering eelgrass and planting the seeds. We learned a lot about flowering patterns throughout the bay. 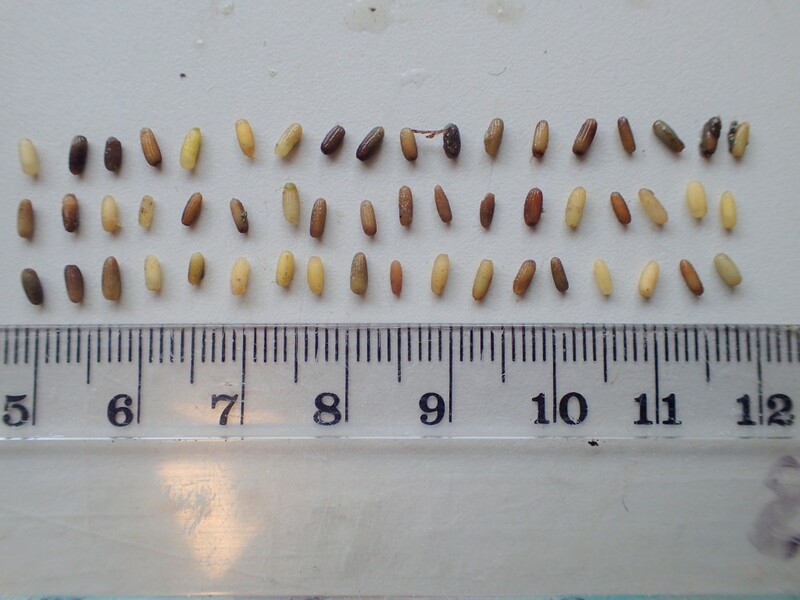 The beds varied in the magnitude, stages, and progression of seed development. Some beds had too few shoots to collect from, while others were plentiful in comparison. This photo compilation shows the different stages of eelgrass flowering. Eelgrass seeds are small and flowering progresses at different rates, so it is not feasible to collect seeds directly in the field. Instead, we collected the blades off of flowering shoots and stored them in mesh bags off a dock in the estuary until the seeds were mature and ready to be planted. Once we were ready to start planting, we sorted through all the blades to separate out the little seeds. We had a relatively low number of blades (600 total), so were able to do this by hand in our lab. We used tweezers to sort through the eelgrass wrack and pull out the little seeds. The seeds had variation in both size and color. Immature seeds are white or light green in color, with a soft outer coat. Mature seeds will have a hard, protective outer layer with longitudinal ribs and can range in color, from white to dark brown (Granger et al, 2003). Though all these seeds came from the same eelgrass bed on North Sandspit, there was lots of variation in size and color. You can see the ribs in the coat in some of the seeds. Studies have found that as long as the seeds are firm, have an intact seed coat and sink rapidly in salt water, they are viable seeds, despite the variation in color (Marion and Orth, 2010). We tested each seed to see if they sank rapidly in sea water and separated out all the ones that didn’t. We then put the seeds into burlap sacks. Other studies found that seeds planted in burlap sacks had higher survival. The sacks helped anchor the seeds down while protecting them from predation and sedimentation (Harwell and Orth, 1999). These sacks will also make it easier for us to come back and monitor to determine how many seeds germinate. We used garden staples to anchor the burlap sacks into the sediment, to ensure they remain in place. Paddleboards make for great mobile desks for eelgrass work. Field technician Kelley gets the burlap sacks ready for planting. We currently have seeds out in two locations in the bay—one by our transplant plot in the forebay and a second by State Park Marina. We are currently deciding where to put our remaining seeds, which will go out in the next round of negative tides. Karissa gets ready to place a burlap sack into a plot in the forebay. We will keep a close eye on these plots and will hopefully start to see seed germination around February. Subscribe to our blog at MBNEP.org/blog to receive a story like this every Friday. Donate to the Estuary Program to support our work in the field and beyond. Granger, Stephen & S. Traber, Michael & W. Nixon, Scott & Keyes, Raymond. (2003). A Practical Guide for the Use of Seeds in Eelgrass (Zostera marina L.) Restoration. Harwell, M. C., and R. J. Orth. 1999. Eelgrass (Zostera marina L.) seed protection for field experiments and implications for large scale restoration. Aquatic Botany 64:51-61. Marion, S.R. and R.J. Orth. 2010. 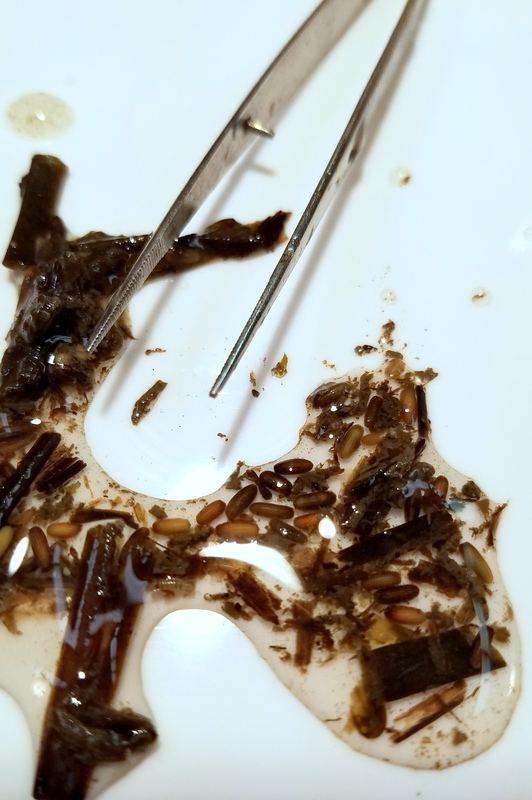 Innovative techniques for large scale collection, processing, storage, and dispersal of eelgrass (Zostera marina) seeds. Restoration Ecology 18:514-526.